"In the end, it's another loss"
The Cats have run out 38 point winners after struggling to shake off the Power for most of the game. It was a hard fough win and one that the Cats deserved. GOAL CATSHawkins marks 40m from goal directly in front, he comes in and kicks his second goal of the day as the siren sounds. 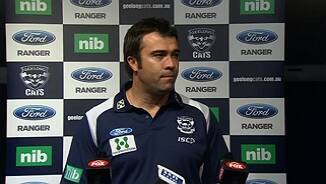 The Cats are now just looking at running down the clock, knowing that they have the four points in their grasp. BEHIND CATSJohnson marks 40m from goal on a slight angle, he roosts the ball for goal but it just squeezes in for a point. BEHIND CATSHawkins marks 50m from goal near the boundary, he keeps it low and has the distance but not the accuracy. Podsiadly does not have his kicking boots on today, as he fails to make the distance from 50m out. GOAL CATSLonergan comes out and takes the mark at the edge of the goal square, he comes in and rings the bell signalling that the Power come back is over. BEHIND CATSMotlop with a flying shot at goal from 45m and it goes through the right side of the goal post. We are just into time on and there is more than enough time for the Power if they are good enough. BEHIND CATSBartel marks 40m out near the boundary, he has a shot on goal and it drifts across the face of goal and through for a point. BEHIND POWERScarlett punches it through for a rushed behind as the Cats look to reload and take it into attack from the kick in. GOAL POWERPfeiffer pings Horlin-Smith for holding the ball, 15m out directly in front of goal. Pfeiffer comes in and cuts the margin back to 23 points. The Cats fans are not happy with the umpiring, even though their team is ahead and seemingly safe. BEHIND POWERBrad Ebert marks 40m from goal on a slight angle, he heads for goal and is offline for a point. Geelong lead by 29 points. GOAL POWERLobbe is pushed in the back by Scarlett 20m out directly in front, he kicks the goal to keep the door ajar for the Power. GOAL CATSHawkins marks uncontested, he spots Taylor on his own and he goes to him, he plays on and kicks his third goal of the day. The Cats are home. GOAL CATSGreat play from Stokes, who kicks it short to the goal square, with Taylor marking unopposed, he plays on kicks a goal. BEHIND POWERYoung has the chance to bring the Power back into the game, but can only manage a point. GOAL CATSTaylor and Motlop are on the goal line as the ball spills free, Motlop gets boot to ball and goals, with Taylor celebrating, giving the impression that he kicked it. BEHIND CATSHawkins does well to handball it over to Kelly opening up the angle, but he kicks it across the face of goal. Scarlett does well to edge Lobbe under the ball and take the mark, to clear it away from danger. The first goal of the term will be very important in terms of momentum for both teams. BEHIND POWERButcher kicks it off the ground but it is touched on the line by Mackie. SUBSTITUTION CATSWe are back for the final term, with the Cats bringing on Stokes in place of Taylor Hunt. The siren sounds to end the third term, with the Cats hanging onto a 19 point lead and the Power are coming home with the help of a slight breeze. BEHIND POWERStewart gathers the ball from the pack, spins out of trouble and sizes up the goals, but pushes it away to the left. Stewart marks just on 50, but on a 45 degree angle, he comes in with the kick but it falls short and punched over for a throw in. GOAL POWERWesthoff picks up the spill of the marking contest, looks up at goal and drills it. We are back to a 20 point ball game. Port will be kicking with a slight breeze in the final term, which will be of assistance to them. Young is starting to have an influence on the game since coming onto the ground, he has had two disposals and has figured heavily off the ball. The Power will need the next couple before three quarter time to give themselves a chance in the final term. GOAL CATSJohnson marks inside 50, Chaplin runs over the mark, thinking that Johnson was playing on, 50m penalty. Stevie J kicks for goal from the square and gives the Cats a bit of a break. SUBSTITUTION POWERThe Power have rolled the dice, taking Brett Ebert out of the game in favour of Young. BEHIND POWERCornes has a long range shot on goal and it is touched on the line for a point. The rain is starting to come down once again, making conditions work in the Cats favour, as a 21 point margin is hard to make up in the wet. The game is in the balance at the moment, the next goal will really give us an indication as to which way this game could swing. BEHIND CATSPodsiadly gathers the loose ball just inside 50, has a shot on goal and just squeezes it through for a point. Another goal for the Power and all of a sudden we will have a game on our hands. GOAL POWERBroadbent handballs off to Butcher, who kicks it to an unopposed Brett Ebert inside 50, he plays on and kicks a goal, as the Power cut the lead back to 20 points. The Power need a surge by kicking a couple of unanswered goals in a short period of time, just to make the Cats feel a little uneasy. GOAL POWERFrom the stoppage Wingard gathers it out the back in the corridor, slams it onto the boot and it is through for a goal. The Cats continue to hold steady, not allowing the Power to come to the party. GOAL CATSHorlin-Smith is out on the lead and marks 30m from goal directly in front. The hyphen kicks his first goal of the day. BEHIND CATSDuncan kicks long for goal, Chaplin gets a finger to it as it bounces to the goal square and Carlile rushes it through for a point. GOAL POWERWest puts his hands into the back of Lobbe, 25m from the Power's goal. 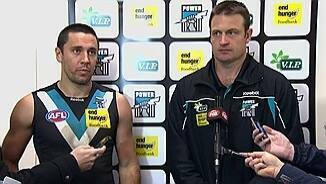 The umpire awards the free kick and Lobbe never looked like missing. The Power are doing their best to send the ball into attack, as they hope to cut the margin back. Geelong hold a 31 point lead over the Power as they mountain continues to get bigger to climb for Port Adelaide. GOAL CATSEnright reads the play well, as he gets into good position, takes the handball and drills the goal. We are back for the second half as the Power have the work to do ahead of them. The siren sounds to end the first half, as the Cats take a 25 point lead into the main break. Hawkins takes a diving mark 45m from goal near the boundary, he takes the kick for goal and it falls short. GOAL CATSGreat running by Duncan, who kicks it off to Hawkins in the goal square, who marks unchecked, plays on and kicks a goal. In a case of calm before the storm, the sun has come out for the first time today. The Power continue their good work around the ground, but are not doing the work on the scoreboard, where they need it the most. All of a sudden the lead has blown out to 19 points, not impossible for the Power but the rain will make it very hard. GOAL CATSJohnson takes an uncontested mark inside 50, he plays on and hands it off to Selwood who kicks his second goal in a row. BEHIND POWERButcher has a kick on goal and is offline once again, the Power cannot buy a goal at the moment. The Power need to get a goal onto the scoreboard as could be left behind the Cats. 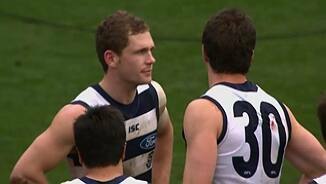 GOAL CATSChristensen hands it off to Selwood from the ruck contest, Selwood kicks a steadying goal for the Cats. BEHIND CATSThe ball comes off hands for a rushed behind. BEHIND POWERWingard gets into good position, he kicks for goal and it goes off the boot a little too roughly. BEHIND POWERButcher marks 40m from goal, he has a shot on goal but is unable to post the goal onto the scoreboard. It appears to be about 1520 minutes away before the rain will grace us once again. 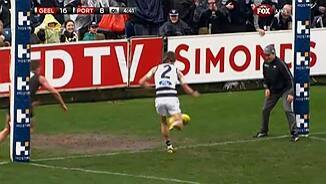 BEHIND CATSSmedts marks 40m from goal, he takes the kick on goal and pushes it away to the right. The Power continue to push the Cats from pillar to post, but are unable to put the proof onto the scoreboard. BEHIND POWERGuthrie rushes it through for a point as the Power edge closer on the scoreboard. The Cats should be leading by a larger margin than nine points, but their kicking at goal has let them down. BEHIND CATSTaylor Hunt's mark is infringed in the middle of the ground, 50m penalty, it brings him to within 30m out and his snap at goal is offline. BEHIND CATSDuncan marks 45m from goal on a slight angle, he takes the set shot and sprays it across the face of goal. Harry Taylor is playing up the ground as a forward once again, a position that he had great success with about four weeks ago. The first goal of the quarter will be a very important one in terms of momentum. We are back under way for the second term, as the Cats get first use of the ball. The Cats go into the first break holding a seven point lead over the Power who have been fighting hard. BEHIND POWERBrett Ebert has a quick shot on goal but it is touched off the boot and through for a point it goes. There is enough time for either team to score a goal before the first break. Kelly has had a big first quarter with nine possessions. GOAL POWERWesthoff is up against three in the goal square, Rodan kicks it to him and the Hoff follows the flight of the ball to take the mark, he kicks it straight through for a goal. The Power continue pushing into the forward line, it appears only a matter of time before they score. GOAL CATSCorey kicks for goal but Brad Ebert punches it down to the goal square and keeps going, Smedts' eyes light up as he gathers the ball and kicks an easy goal. BEHIND CATSHorlin-Smith kicks it into the goal square, Hawkins contests for the mark, but it spills to the ground and is rushed through for a point. BEHIND CATSMotlop soccers it off the ground, Rodan claims that he touched it on the way through and the goal umpire agrees. It is a very different looking Geelong side today, with many of their stars on the sidelines, but the core players are still there. The game has opened up in the last few minutes, with both teams fighting fiercly for the ball. The players of both teams continue to brave the cold and wet Melbourne conditions. BEHIND POWERThe ball is paddled through for a rushed behind for the Power. GOAL CATSThe ball comes off the lower leg of Logan and it is awarded out on the full. Duncan takes the free kick 20m from goal and makes no mistake. BEHIND POWERLogan gives it off to Broadbent, who kicks for goal but is offline. BEHIND CATSGreat body work by Podsiadly as he finds the front position to mark in front of Chaplin, he snaps for goal and it never looked likely. Murdoch is pulled off the ball, as the Cats fans look for a free kick, but they don't get one. GOAL POWERCornes takes the spill of the ball, kicks around the corner and kicks the first goal for the Power. The Cats are doing the best with the slippery conditions at the moment. GOAL CATSTaylor comes out on the lead and grabs the mark 35m out directly in front, he kicks the first goal of the day. BEHIND CATSMurdoch gathers the loose ball, slams it onto his boot for goal and he fails to join the kicking a goal with his first AFL kick club. 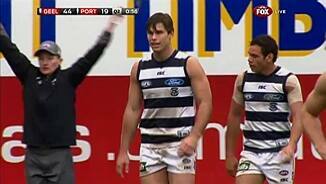 Geelong have Stokes starting out with the green vest whilst the Power have Young as their sub. The ball is bounced in the middle and we are under way. Welcome to a wet and rainy Simonds Stadium for the match between Geelong and Port Adelaide. The Power have one late change with O'Shea coming in for Surjan. The Cats are as selected.